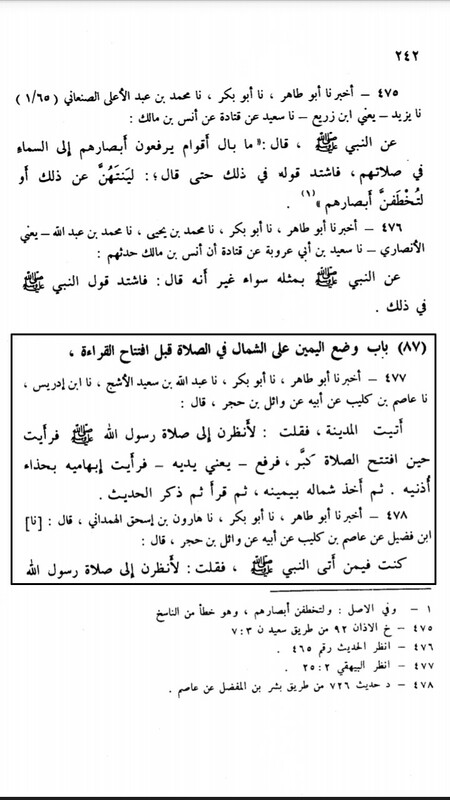 Tying Hands on chest in Salah- A critical analysis of the Hadith of Wa’il ibn Hujr in Sahih of Ibn Khuzaima. Wahhabism, the ultra conservative sect which claim to follow “True Islam” of the Salaf have left no part of religion where they have not innovated something new, mainly in order to look different from those whom they consider as deviants. Unfortunately for them, they have turned out to be the biggest innovators in Islam, walking in the footsteps of Khawarij and taking a total different path than that of Salaf As Salih. One of the most absurd innovation of theirs is tying hands on the chest during Namaz. Neither the Prophet صلى الله عليه وسلم, nor any of his pious successors رضوان الله يجمعن have tied their hands towards/on the chest during Namaz. Note: Many people might question that, “Why women are instructed to tie their hands on chest if it was not done by the Prophet صلى الله عليه وسلم? The answer to that is, The Prophet himself had instructed the women to do so. It is also proven through the amal of many Sahabiya and Umm Al Momineen Bibi Aisha (رضي الله عنه). It will be discussed else where. Sahih Ibn Khuzaima, Vol 1, Pg 243, Narration 479. There are many defects in the chain of narration, but first, we will discuss the wordings in other versions of this hadith. Hence, it is clear from the other versions of this hadith that the words, “On the chest” are added by a Sub narrator (Mua’mmal bin Ismail) and doesn’t go back to Wa’il Ibn Hujr. The main narrator in dispute here is Mua’mmal Ibn Ismail. Lets discuss about the condition of this narrator. He was one of the Shuyukh’s who narrated from the giants like Hammad bin Zaid, Sufiyan Al Thawri, Sufiyan Ibn Uyayna and Fu’dail bin Iyad. 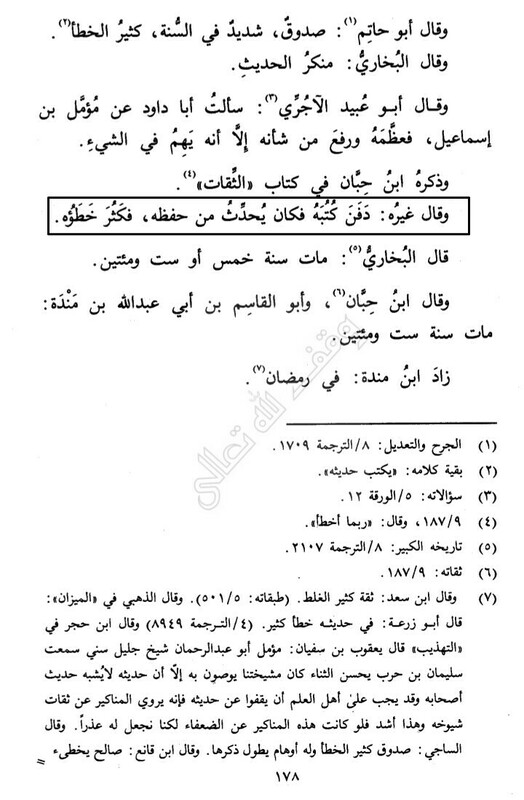 He was graded “Trustworthy” by Imam Yahya Ibn Mae’en (Al Jarah Wa Tadeel, Ibn Abi Hatim, Vol 8, Pg 374, Narrator no 1709/ Tadhib Al Kamal, Al Mizzi, Vol 29, Pg 177). But Ibn Abi Hatim himself, after quoting Yahya Ibn Mae’en, said, He is “Truthful” (Saduq), intense in Sunnah but “MAKES MANY MISTAKES”. 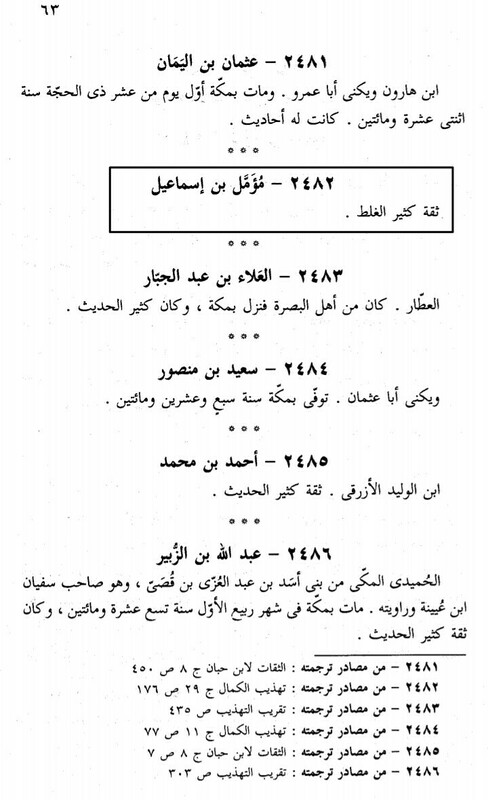 (Al Jarah Wa Tadeel, Vol 8, Pg 374, Narrator no 1709). 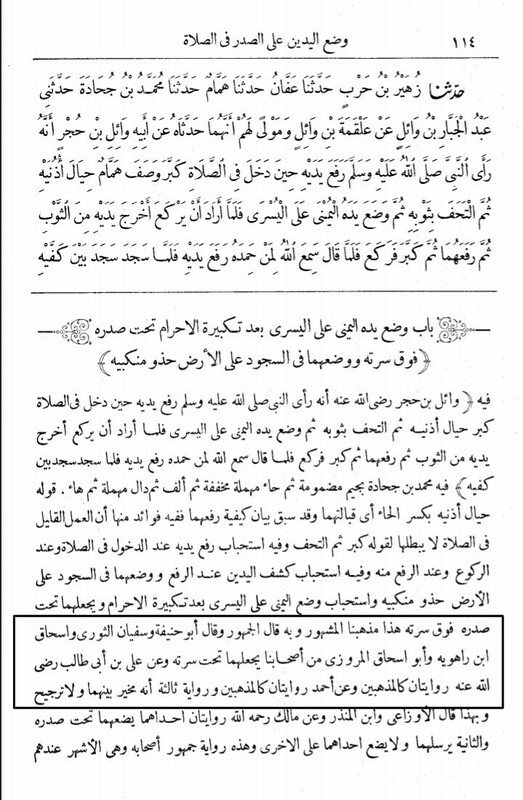 Al Jarah Wa Tadeel, Ibn Abi Hatim, Vol 8, Pg 374. Ibn Sa’ad, Tabaqat, Vol 8, Pg 63. 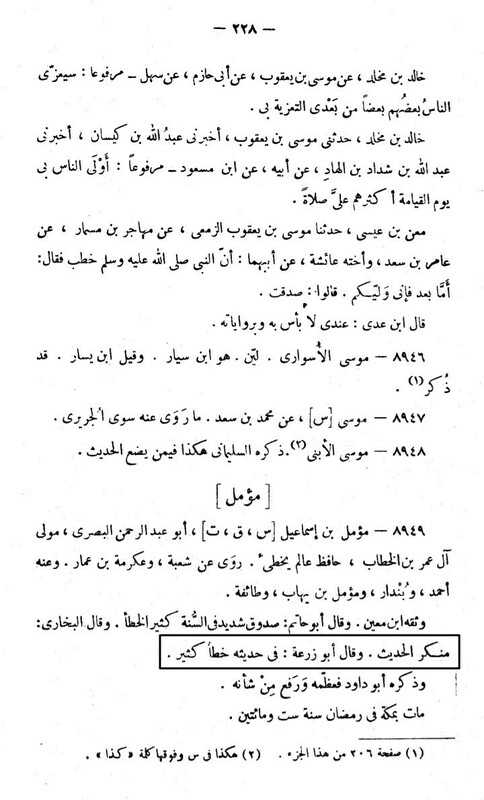 Al Dhahabi, Mizan, Vol 4, Pg 228. 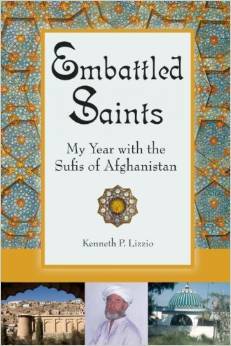 Many said, “He was a huffaz until his books were buried. Then, he started making mistakes.”[Because he was forced to narrate from his memory] (Tadhib Al Kamal, Vol 29, Pg 178). Al Mizzi, Tadhib Al kamal. Vol 29, Pg 178. After reading the above Jarah of the scholars, we can understand that the addition of the words “On the chest.” in the hadith was a MISTAKE. It is also understood from other shawahid narrations from Wa’il Ibn Hujr. This should be enough for a sane Muslim to accept the truth and, not act upon the added words, but Wahhabi’s are known for their ego driven madness. So, we will further discuss the problems in this narration. The second problem with the chain of narration is Mua’mmal bin Ismail has narrated this from Sufiyan al Thawri. 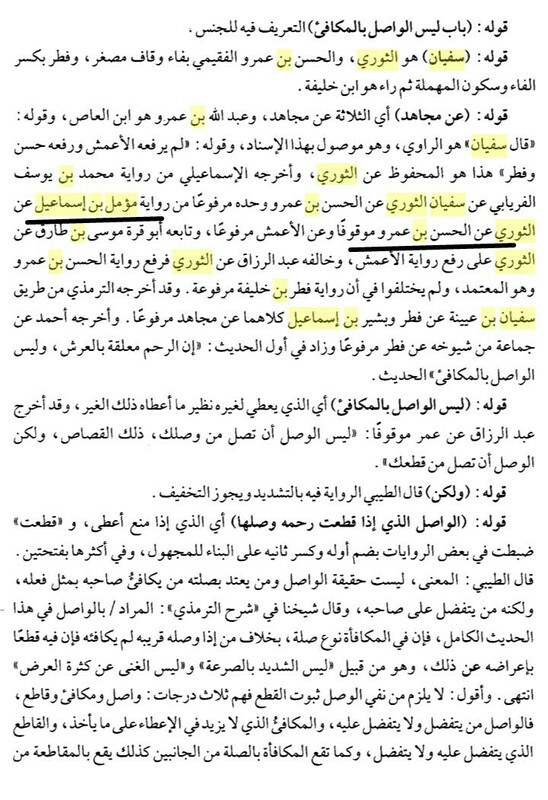 Ibn Hajr writes in his Fath Al Bari, Vol 13, Kitab Al Adab, chapter 15, Pg 529 that, “The narrations of Mua’mmal bin Ismail from Al Thawri are MAUQUF (Stopped/doesn’t go back). This further weakens the narration. 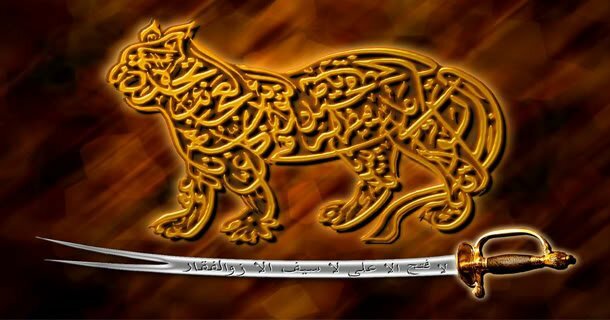 Abu Hanifa, Sufiyan Al Thawri, Ishaq bin Ruwayah, Ishaq bin Marwazi (رضي الله عنه) were of this position because they had a narration of Imam Ali عليه سلام who said, “Verily, it is from the sunna to place the right hand over the left under the navel”. 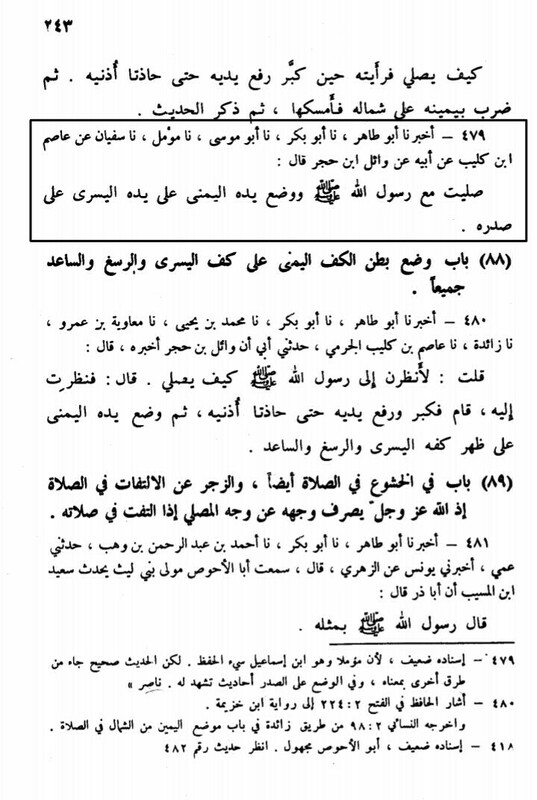 Al Nawawi, Sharah Sahih Muslim, Vol 4, Pg 114. Note: This narration from Hazrat Ali عليه سلام contains a weak narrator but the matn is supported by many Shawahids. That’s why it is acted upon. This will be discussed in an another article if Allah permits. How can a person like Imam Sufiyan (with such great status and caliber), teach one thing and follow the other. This clearly proves that the words “on the chest”, is an error. 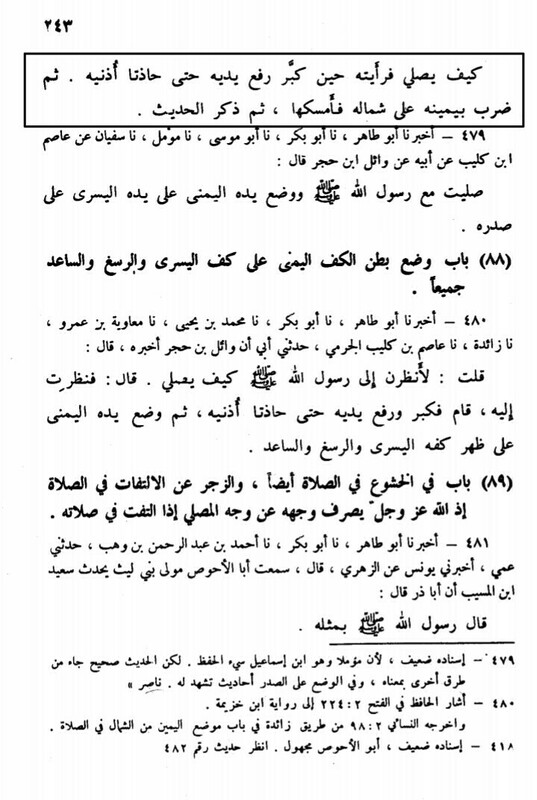 If we observe the text of Sahih Ibn Khuzaima, one would find Imam Ibn Khuzaima commenting on the authenticity of the narrations soon after narrating them. But in this case, we don’t find him commenting anything below the narration. Hence it would be stupidity to believe that every narration in it is sound because it came in a book with the initial “Sahih”. Important of all, this narration neither has any Shawahids nor is it narrated from any other companion or from another chain of transmission. 1) This narration of Ibn Khuzaima, narrated from Wa’il Ibn Hujr comes with many other chains without the words, “On the Chest.” This is a single narration with these words and hence will be considered as an error based on Usul Al Hadith. Those words are to be considered as Fabrication. 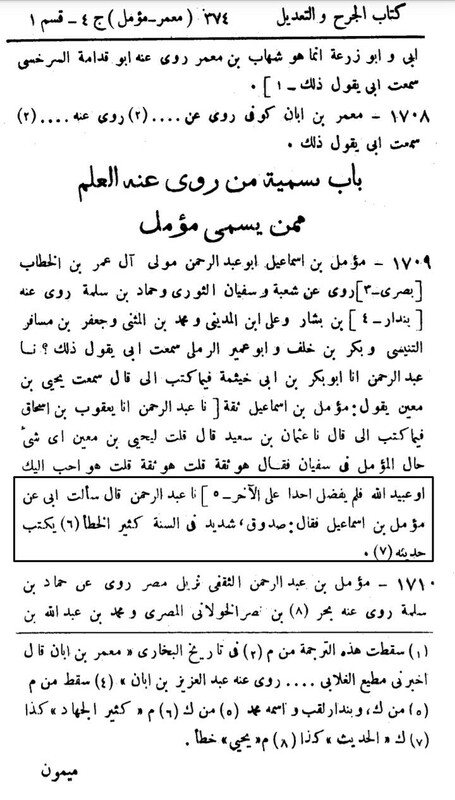 2) Mu’ammal Bin Ismail was a trustworthy Hafiz but he made many mistakes in narrating the hadith, because his books were buried and he was forced to narrate from his memory. This narration seems like one of his mistake. 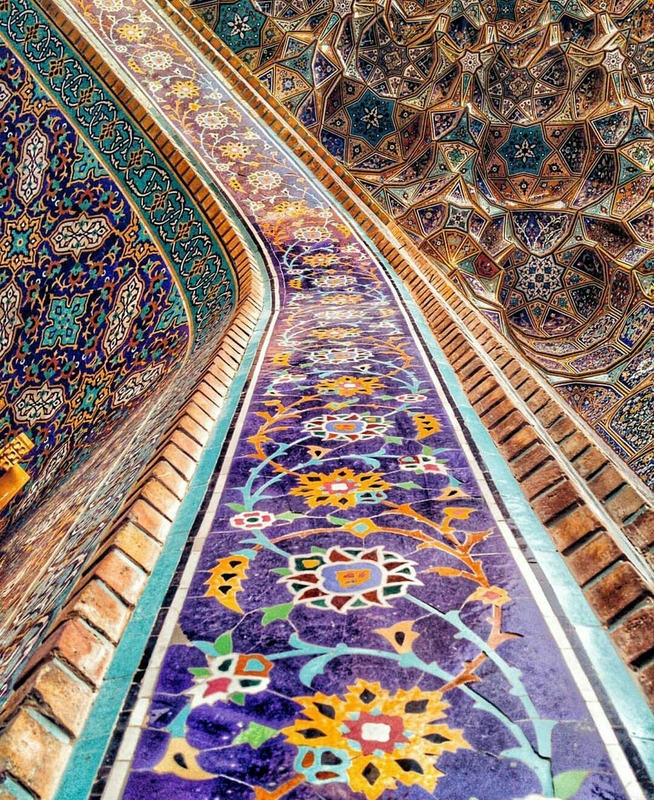 3) The connection between Mu’ammal Bin Ismail and Imam Sufiyan Al Thawri is Mauquf (broken). Mauquf narrations are weak even near Wahhabi scholars. 4) Imam Al Thawri himself believed in placing the hands below the navel in Salah. How could he narrate something which he doesn’t believe? If this narration is supposed to be sound, then why didn’t he change his stance? 5) Imam Ibn Khuzaima himself remained silent on the soundness of this narration. Hence it cannot be said that Ibn Khuzaima deemed this narration to be sound.